With new solar and wind installations at two of its ballparks, Major League Baseball opens the 2012 season showing America the national pastime is still at the vanguard of social and technological change. Baseball was the first sport to play under lights, break the color line, pioneer live television broadcasts, end restrictive player-management relations, and lead the way into Latin America and Asia. Now it is swinging for the fences by driving the shift toward distributed renewables. 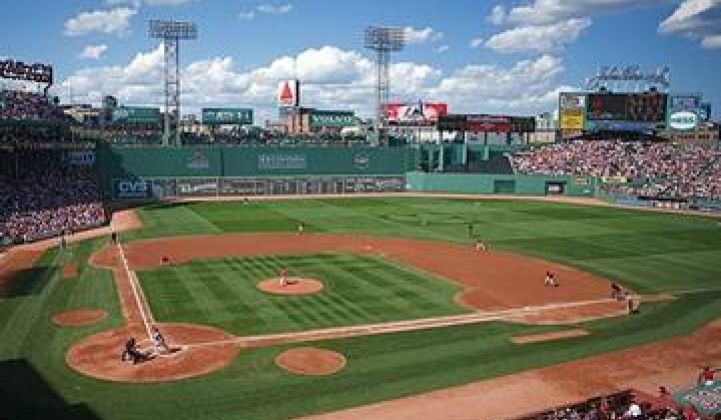 In the last few years, the Boston Red Sox, San Francisco Giants, Kansas City Royals, St. Louis Cardinals and Cleveland Indians installed photovoltaic (PV) solar systems at their ballparks. This year, the Seattle Mariners are joining the movement and the Indians are advancing the cause by adding a cutting-edge small wind turbine complex. The Minnesota Twins, the Royals and the Mariners are also leading a move to smarter, greener ballpark operations by turning to more efficient lighting and heating and cooling systems and helping fans recycle the wrappings and containers of hotdogs, peanuts and other ballpark treats. 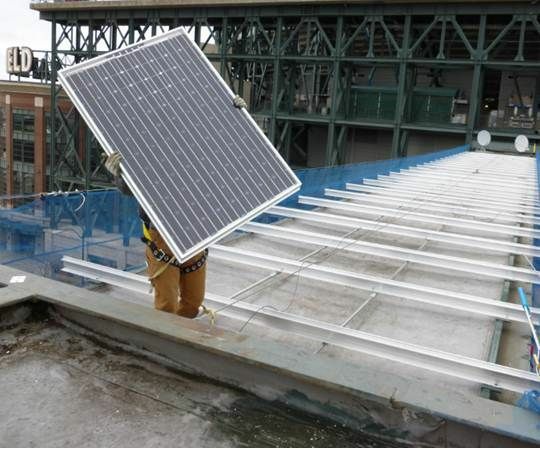 The Mariners, who opened their season by splitting a two-game series against the Oakland Athletics in Tokyo March 28-29, have just installed a 32.76-kilowatt PV system expected to score big with 40,000 kilowatt-hours of electricity per year for Safeco Field. 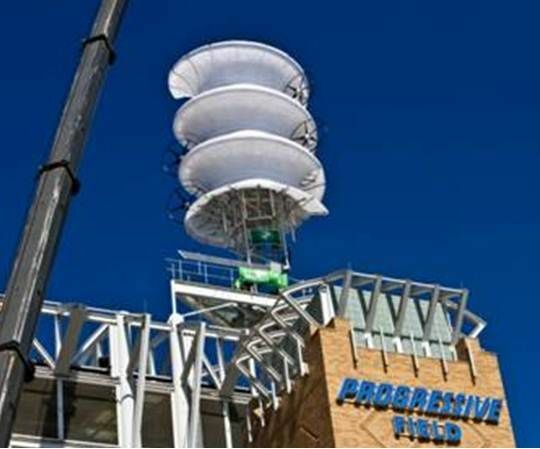 The Indians will open April 5 against the Toronto Blue Jays at home where an experimental helical structure with four small wind turbines attached to it has been built atop one of Progressive Field’s towers to knock home 25,000 kilowatt-hours of electricity per year for the stadium. The 168 Panasonic HIT Double solar panels, explained Panasonic communications manager Aaron Fowles, were as many as would fit atop Safeco Field’s parking garage elevator canopy and the skybridge leading there. They are expected to provide 10 percent to 30 percent of the electricity used for lighting, elevator operations and other services in the parking garage, Fowles added. The Mariners, Fowles noted, have a serious commitment to sustainability. They have also installed electric vehicle charging stations and high-efficiency lighting at Safeco Field and, he said, recycling bins throughout the ballpark. Panasonic is a Mariners sponsor and provided the panels at a discount to spur the team’s introduction to distributed renewables. A display installed with the solar system allows stadium operators to track its output and, Fowles said, monitors are placed where fans can do so as well. A screenshot of the panel’s output, he added, could very well turn up on the stadium’s big screen between innings. Panasonic also does educational outreach to kids with demonstrations about the benefits of solar and, Fowles said, the company is considering how it might incorporate the ballpark installation into that program. Progressive Field’s prototype small wind turbine complex, designed by Cleveland State University engineering department chair Majid Rashidi, is funded by the U.S. Department of Energy. Its spiral, “wind-deflecting” central structure, Dr. Rashidi explained, is designed “to guide the wind to the blades” of the four 1.6-kilowatt, three-blade, horizontal-axis wind turbines attached to it. The central spiral is an aluminum cage with plastic surface panels. It is mounted on a 26-inch industrial bearing which sits on a turntable on a steel platform. The steel platform rests atop one of the stadium’s brick towers. Turbines are fixed by aluminum arms to the aluminum cage. The plastic panels cover the rest of the cage in a way that gives the structure a corkscrew appearance. This helical surface acts as a wind “spoiler” that guides the wind to the turbines. The central structure turns on the bearing in response to the force of the wind until its turbines are positioned for maximum productivity. Wind that hits the central structure is funneled into the turbines by the helical surface, actually gaining speed as it goes, Rashidi said. Because the essential elements of the prototype structure are aluminum and plastic, Rashidi said even greater productivity could theoretically be obtained by tethering it to a surface structure and floating it high in the air. The turbine’s 24,000-kilowatt-hour annual productivity is based on Rashidi’s estimate of a 40 percent to 50 percent capacity factor. That is a high number, Rashidi agreed, but possible because it is near Cleveland’s windy lakefront and high atop Progressive Field. “A more typical rooftop mounting would have a more normal capacity factor of 25 percent to 30 percent,” Rashidi added. In other words, Rashidi’s turbine design makes solid contact with the wind instead of letting it blow by, like a batter smacking a long ball instead of taking a pitch.